We begin our story with a calm, rather imperturbable, and retired 76 year old chambermaid living independently in her own home. She knew that life was a series of endless challenges and had suffered a few ailments in her time, but was content to putter around at home and enjoy her retirement. This routine was rudely disrupted one day when she developed slurred speech and a mild headache. This was not enough to make her come in though; her daughter noted the change in speech and called an ambulance. On arrival to our hospital, our chambermaid was assessed in the emergency department. She thought that her speech had become slurred sometime during the day before, possibly around 2 pm. Aside from the headache, she had no other complaints. Her medical history included a few things, notably coronary artery bypass grafting (CABG) surgery (where vessels from elsewhere in the body are used to bypass narrow sections in the coronary arteries) three weeks previously, which was complicated by an infected right long saphenous vein as well as a brief run of perioperative atrial fibrillation (an abnormal heart rhythm that can produce ischemic strokes). She also had a history of hypertension, a dilated left atrium in her heart, and cervical cancer. She took aspirin and a few other medications for her heart, and had no allergies. The emergency doctor noted that our patient's blood pressure was 164/95 mmHg, her heart rhythm was currently regular, her speech was dysarthric (slurred), and thought that she may have a mild expressive aphasia (speech disorder marked by a reduction in the ability to produce language); otherwise, she was normal. A computed tomography (CT) scan (a three dimensional x-ray) of the head was normal. The emergency doctor suspected either a transient ischemic attack (TIA) (where an area of the brain has been functionally "stunned" after being temporarily deprived of oxygenated blood, but recovers) or a small ischemic stroke (an area of the brain that has died after being deprived of oxygenated blood for too long). He referred the patient to one of our most experienced general physicians, who came to the conclusion that yes, given the recent and longstanding cardiac issues, the chances of a cardioembolic TIA or stroke would be high. He ordered a carotid ultrasound (a machine that uses high-frequency sound waves to create images of the carotid arteries, a common stroke source); this came back normal. Thus was our chambermaid admitted to the stroke unit, which is where I met her the next day. She was sitting in a chair by her bed, and appeared comfortable. I performed my usual history and examination, and noted nothing new. This case seemed pretty ordinary. I explained to our patient that I largely agreed with the conclusions of her previous doctors, although since she had suffered these symptoms for nearly two days now, this could not be a TIA as that would have resolved by now. I suspected an ischemic stroke secondary to a small cardiac embolus (any detached mass travelling within a blood vessel), either formed from paroxysmal atrial fibrillation or the dilated left atrium. Such things should be confirmed if possible, and I eagerly awaited the results of a magnetic resonance imaging (MRI) scan (a radiological technique that uses strong magnetic fields and radiowaves to assess the movement of water molecules within body tissues, creating a nice anatomical image) of her brain which was done later that day. 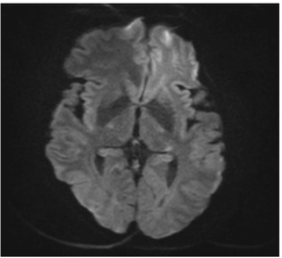 I was really only interested in the diffusion weighted imaging (DWI) component, which shows up ischemic strokes as white areas on an otherwise dark background. 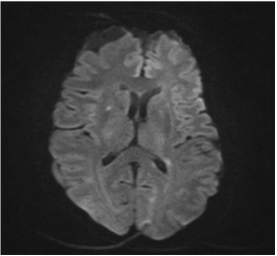 This DWI image shows a tiny white area on the right side of the brain (left on the scan equates to the right side of the brain and vice versa) deep within the right side of the brain, in the caudate nucleus of the basal nuclei. This is probably a tiny ischemic stroke. The radiologist also thought that these tiny white areas on both sides of the thalamus were tiny ischemic strokes. With those MRI findings confirming what everyone expected to see, the case seemed closed. There seemed to be several tiny strokes, and one of them must have been responsible for the dysarthria; I thought one of the thalamic strokes must be the culprit, since lesions involving the thalamus can produce all sorts of different symptoms and signs. We commenced an anticoagulant (a medication that prevents blood clotting) with rivaroxaban, and I wandered on. Of course, that was not nearly the end of it. There are three classic cognitive errors made by doctors, and they all start with the letter "A" - anchoring (when one fixes on a particular bit of information and thinks in a constrained way about it, failing to obtain additional information and thus proceeding down only one pathway of information), availability (when one is strongly influenced by dramatic or unusual cases that are prominent in one's memory), and attribution error (when one is overly influenced by certain personal characteristics, particularly those that correspond to social stereotypes). For whatever reason, I have always been prone to anchoring and have worked hard to overcome this. However, it had struck me again with this case; everything seemed to point to an ischemic stroke, which was indeed confirmed by our MRI scan. The next day, our speech pathologists notified me that our chambermaid's speech was even more dysarthric, and not only that, she was now suffering from a moderate degree of dysphagia (difficulty swallowing) requiring a nasogastric tube (a tube that goes through the nose into the stomach, used to protect the airway as well as for feeding). This was odd; a tiny thalamic stroke triggering a bit of dysarthria I could buy, but worsening dysarthria with profound dysphagia I could not buy, not with those tiny strokes noted on the MRI scan. I returned to see our patient. Her speech was a lot more slurred, and with the nasogastric tube in place she was also clearly dysphagic. She told me that the area around her nose felt tingly; sometimes this can occur with strokes involving the pons of the brainstem. A little perplexed but still anchoring on ischemic stroke, I ordered another MRI scan to see if there had been a new stroke involving the pons. The MRI scan came back, showing no new changes. While I was not really satisfied by this, I trusted in our working diagnosis and our anticoagulation and left the matter at that yet again. Yet another day passed, one in which I had no plans to see our chambermaid for I felt that despite the somewhat incongruous clinical and radiological findings, I knew she had suffered ischemic strokes and we were treating those. Sometimes, however, serendipity plays a role in diagnostic medicine. I just happened to be seeing the patient beside our stoic, uncomplaining chambermaid; while racing by her to leave the room, I stole a quick glance and mentally kicked myself in the head when I saw her eyes, for she had now developed a bilateral ptosis (drooping of the upper eyelids). Now, ischemic strokes almost never result in a bilateral ptosis; there are some that can affect one eye, but both at the same time is next to unheard of. There is another condition, however, that frequently presents with a bilateral ptosis. It's one of my favourites, and I knew now what this lady had. I checked the strength in her face and neck muscles and noted the weakness. On one minute of sustained upgaze, her ptosis worsened. I obtained a bedside spirometer (an apparatus for measuring the volume of air inspired and expired by the lungs) and found that her forced expiratory vital capacity (FVC) (the volume of air that can be forcibly blown out after a big breath) was only a few hundred milliliters; for a lady of her age and size, it should have been at least two liters. I sent off some blood tests to check her for anti-acetylcholine receptor (anti-AChR) antibodies which came back high at 8 nmol/L (normal <0.50 L), as well as a few other related antibodies, and some time later performed single-fiber electromyography (SFEMG) to confirm the diagnosis. SFEMG is an EMG recording technique that allows action potentials from individual muscle fibers to be recognized; the action potentials of two or more muscle fibers innervated by the same axonal motor end plate (the end of a motor neuron where neurotransmitters are released) are assessed for the degree of jitter (the variation in the time interval between two action potentials of the same motor unit). Abnormally increased jitter means the motor end plate is defective. On a technical level, SFEMG is as difficult as neurophysiology testing gets. SFEMG of two different left orbicularis oculi (the muscle that surrounds the eye and closes the eyelids) muscle fiber action potentials (one is marked by a blue line, the other by an orange line) innervated by the same motor end plate. Note how much the variation in time interval between the blue and orange line changes with each successive action potential. Jitter is measured by calculating the mean consecutive difference (MCD); for the orbicularis oculi muscle in a 76 year old lady, the MCD should be 43 microseconds or less (Preston and Shapiro, 2013). In this trace, it is 97 microseconds. All of the action potentials from the above trace, as well as many others not shown on the above trace, can be superimposed. See how much the orange line wavers compared to the blue one; normally, there should not be that much jitter. I only measured six different pairs here for the left orbicularis oculi muscle. Since the jitter was so obviously elevated, I did not need more than this; in most cases, however, it's best practice to measure twenty pairs per muscle. Although I ordered the antibody tests and performed the SFEMG later to confirm the diagnosis, I did not need these results to immediately start treating our patient for what this condition now so clearly was - our stoic chambermaid had anti-AChR myasthenia gravis, probably triggered by the physical stress of the CABG. Myasthenia gravis is an autoimmune condition that results from circulating antibodies that block the receptors for acetylcholine or, less commonly, muscle-specific tyrosine kinase (MuSK), resulting in fluctuating weakness and rapid fatiguability. Anti-AChR myasthenia gravis can occur at any age and has a slight predilection for women over men; in women the mean age of onset is 28 years whereas in men it is 42 years. In 80% of patients with anti-AChR myasthenia gravis, the eye muscles are the first to be affected resulting in ocular myasthenia gravis that is characterized by extraocular eye muscle weakness and ptosis (Jayam Trouth et al, 2012). By two years, over 80% of these patients will have developed generalized myasthenia gravis that has spread to involve the bulbar and limb muscles (Bever et al, 1983). For moderate to severe anti-AChR myasthenia gravis as we had in this case, treatment consists of intravenous immunoglobulin (made from the pooled antibodies of blood donors, this somehow reduces the levels of harmful antibodies) for five days followed by pyridostogmine (a cholinesterase inhibitor) and prednisolone (a steroid that reduces inflammation), as well as a thymectomy if a tumour of the thymus is found. The prognosis for myasthenia gravis substantially depends upon whether or not it is treated. With treatment, mortality is 2-4% (Alshekhlee et al, 2009). Without treatment, it ramps up to 30-60% (Grob et al, 1987; Simon, 1935). Myasthenia gravis often initially presents with ptosis. In this photo, there is a bilateral asymmetric ptosis that appears to affect the extraocular muscles on one side more than the other. Since it is almost always involved in myasthenia gravis, in my opinion the best muscle for SFEMG is orbicularis oculi. If a tumour of the thymus (outlined in red) is found in myasthenia gravis, it should be removed. With that dismal FVC, we moved our patient to the Intensive Care Unit (ICU) and commenced treatment immediately. She was intubated to protect her airway, as patients with myasthenia gravis affecting the respiratory muscles can fatigue and, being unable to breathe, die quickly. After a week, she was extubated and, happily, her speech, swallowing, breathing, and eye muscles were all back to normal. She returned to our neurology clinic a few months later, still normal, and we started the lengthy process of tapering down her medications. Gotta keep watching out for that anchoring! Bever et al. 1983. Prognosis of ocular myasthenia. Annals of Neurology 14(5), 516-519. Jayam Trouth et al. 2012. Myasthenia gravis: a review. Autoimmune Diseases 2012, 874680.